So I teach three classes of seniors. This year, the senioritis has set in early, and hard. I have kids who are already starting to check out. And instead of finding a positive way to bring them back into the fold, I have just gotten slightly sour, slightly annoyed, and scornful. I don’t like when I do that (though I know sometimes it is necessary). The senioritis isn’t yet in full swing, but at least for one class, it’s impacting the fun and enjoyment I have teaching (and consequently, that the kids might have learning). So for any of y’all out there, do you have any CONCRETE advice on how to deal with senioritis? Do you have a come to jesus talk? Do you get all draconian up in their grill? Do you collect and grade homework daily? Do you have a class discussion about the frustration? What would that look like? Do you have weekly quizzes to make sure stay on the ball and focused? Do you do a project? Do you make things more group centered — where students work as a team? In other words, what have you done that works? For the past two years, I’ve talked with my students about how I never lower expectations in the fourth quarter, that I care about them learning the fun stuff at the end of the course, and that they simply need to stay on the ball. But although that generally works for a majority of the kids, I still feel like more kids than I would like have their grades (and understanding) drop in the fourth quarter. I want to keep all of my kids (not just some of my kids) with me until the end of the year. I will soon bring out a new class motto. It used to be “take what you don’t know and turn it into what you do know.” It is now going to be “BE ALL THERE.” I think I will get posters made and hang them in my classrooms, and point to them aperiodically. First of all, I love the posters idea – and I would do it now! (I read a fun idea about free posters w/ rastering from Dan Meyers – can’t find it now). That will get your message across in a fun but serious way. “Do you collect and grade homework daily? If you weren’t doing these things before, certainly don’t start them now. 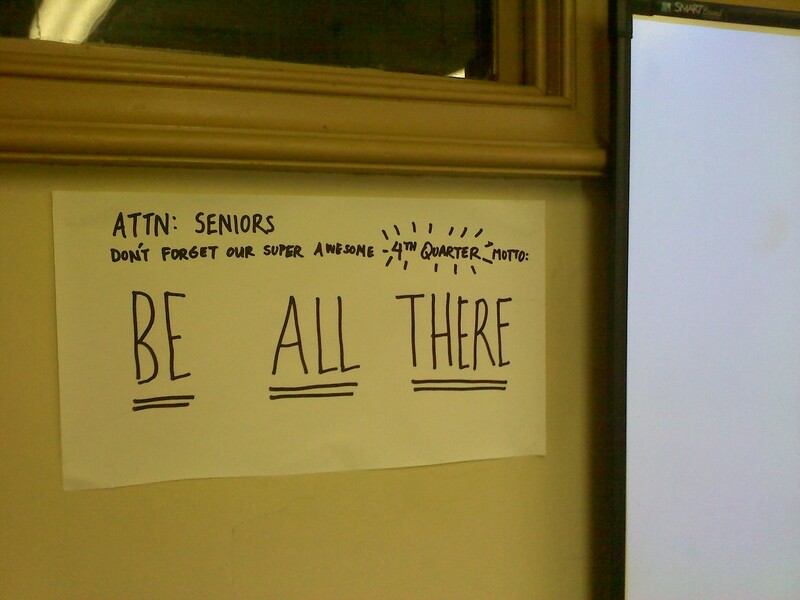 As in, you can’t MAKE seniors do anything. There is probably a reason you don’t do these things, they aren’t you. At the end of the year when things at school are crazy for you (reviews, finals, end of year grades) do you really want to throw in a pain in the rear incentive plan that you will have to keep up with or hw that you have to grade everyday? NO! Plus, even though you can’t help but feel sour now b/c of their attitude, do you really want to spend the last of your days with them being a teacher than you have not been all year? This month you need to TALK LESS – about everything. You do have to go a little draconian, putting on your serious face more, bc they will not be used to you talking less. What I usually do often at this time is your last suggestion – work in groups. Work in groups of two so the talking doesn’t get out of hand. This is when the teacher to student talk ratio should reverse. If they are actively working on something interactive then they will (hopefully) be more engaged. This is the time for learning games, hands-on activities, scavenger hunts and all of the tricks you can pull out! Get them moving around the room – wake them up! It is a lot of work (almost as much as making and grading lots of quizzes or daily hw) but is a LOT more fun! You may even have fun too – maybe. I unfortunately have all mixed-year classes, so it gets tricky. Regardless, when the sun comes out, everyone tunes out. I find that the “come to jesus” talks are more frequent this time of year anyway. I pre-talked my juniors/seniors in February and said “you have to do x, y, z to get out of here in one piece”. They all bought in (surprisingly). I have a few that know if they coast, they can pass, and have tuned out. On some level this annoys me, but it’s their choice. As far as practical “now” things, I am trying to have the classes do more group activities & projects, especially ones that get them outside (c’mon sunshine, I need ya next week!). I tried this last year on a whim (put together an activity in about 10 minutes… learned to NEVER do that again) and despite the epic math-fail that I created, it got my kids excited. If you ask me, they’ll only come back if it’s relevant to them. I remember as a senior, the only thing that was relevant was not being in school… it’s a tough sell for anything else. Like everyone else is saying, good luck! We feel ya! Hihi all, thanks for your advice. I think next year I need to redesign my calculus course so I have more activities in the 4th quarter… I might be able to do bits and pieces here and there. I actually wanted to teach a unit on probability and calculus — but I think it’ll have to wait, because I’d have to throw out the window some other stuff that I can’t let go of (solids of revolution!!! ).